(CNN) — A body believed to be that of an 18-year-old barista who disappeared in February has been found in a lake north of Anchorage, police in Alaska said. 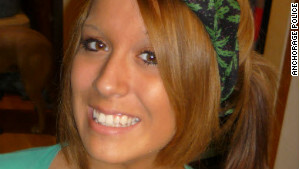 Samantha Koenig was last seen on February 1. “Although some questions have been answered today, I know those answers offer little consolation to the Koenig family and that many more questions remain,” said Mary Rook, the special agent in charge of the investigation. Police said security footage showed an armed man wearing a dark hoodie leading her away. Gone, too, was the cash from the stand’s register, as well as Koenig’s coat, purse and cell phone. Koenig’s family offered a hefty reward for information leading to her return. Friends and volunteers distributed more than 45,00 fliers door to door. The crime struck at one of the hallmarks of the Anchorage community, the tiny coffee stands around town, wrote Daily News columnist Julia O’Malley. On Monday, police said a man, already in custody for an unrelated crime, will be charged with kidnapping and murder. Without naming the man, Chief Mew said he acted alone and that Koenig died within hours of her abduction. Authorities also said investigators found no “direct association” between the abductor and Koenig or her family members. The only person listed as a “person of interest” in the case is a 34-year-old contractor from Anchorage who was arrested last month in Lufkin, Texas. The man is accused of using a debit card taken from a vehicle on the night of Koenig’s abduction and using it at various locations in Anchorage and also in Arizona, New Mexico and Texas, reported KTUU TV. U.S. Marshals brought him back to Alaska, and he is being held at the Anchorage Correctional Complex.